Nebraska Memories contains thousands of images. Many of these images show buildings and street scenes from across the state. When the metadata that accompanies these images includes an address I like to find the location on a map. Finding the location on an online map is easy but since so many of the buildings have changed over the past 100+ years I don’t always find it helpful. When I saw the Library of Congress’s (LOC) announcement that they were providing access to nearly 25,000 Sanborn Fire Insurance Maps I was thrilled. At this time, the maps from sixteen states are available. Lucky for us one of those states in Nebraska. Currently all of the maps available were published prior to 1900. If you’ve never seen a Sanborn Fire Insurance Map before they may seem a bit odd the first time you look at one. As the name implies, these maps were created for assessing fire insurance liability. On the maps, you will see the outline of buildings along with information about building materials, the number of doors and windows and the amount of hose available. If you need help understanding all of the abbreviations and symbols on the map like I did, I’d suggest you look at the LOC’s About this Collection page. I started exploring the Sanborn maps by first picking a few photos in Nebraska Memories and then trying to locate them on one of the maps. As I looked at different places on the map, I realized how much information was available. That information combine with seeing how a building related to other structures around it provided me with a fresh perspective of images I’ve viewed multiple times. One photo that I selected was the Beet sugar factory, Grand Island, Neb. On the photo, note the two raised sections on the roof and the smoke that is rising from behind the building. Now let’s look at the 1899 Sanborn Fire Insurance Map from Grand Island, Hall County, Nebraska. 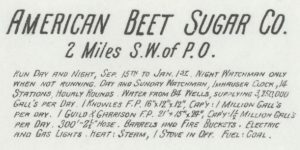 I found the American Beet Sugar Co. located on image 18 of the map. Under the name, it says, “2 Miles S. W. of P.O.”. The P.O. as you may have guessed stands for post office. I’ve included a screen shot of paragraph of information available on the map. As you read it, remember these are fire insurance maps. On the drawing of the building, do you see the yellow square with the long yellow rectangle below it? It looks like a yellow i in the middle of the building. If you zoom in on the original map image you can see the words “Tank on R’F.” next to the square and “Vent in R’F” next to the rectangle. Now look to the left of the main building and find the building with the think black lines and small circles. The black lines represent steam boilers. The circles are iron chimneys. The circle with the black dot in the middle is the fire pump. I’m assuming the smoke or steam that we see in the picture is coming from this building. Taking these three pieces of information and comparing it to the photo, I would guess this picture shows the east side of the factory. Looking at the map, you will see other features of the factory such as the “underground sluice” that connects the beet shed to the main building and the “Molasses Reservoir (underground) Wood Cover”. These maps were drawn to scale so we can see that the reservoir is huge. Other areas I noticed include washers, brushes, slicing machine, granulator, press room and lime slackers. 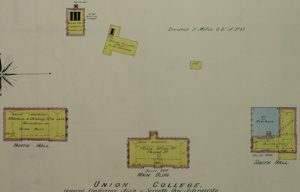 Next, I located the Union College campus on image 47 of the 1891 Sanborn Fire Insurance Map from Lincoln, Lancaster County, Nebraska. 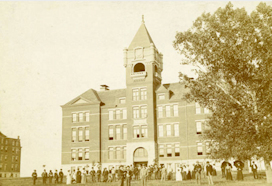 The Union College, Ella Johnson Crandall Memorial Library has a collection of 100+ images in Nebraska Memories so I knew there were many photos available. When you look at this map or any of the Sanborn maps, make sure you look for the compass rose on the map and locate north. At first I had assumed the top of the map was north but quickly learned that is not always true. The location of north can even change from one image to the next. If you look at the full version of the Union College map, you will see that north is to the left. The map shows five buildings located on campus. There are images of the three largest building in Nebraska Memories. Because these three buildings have been torn down, this map gives us a better perspective on exactly where they were located in relationship to each other. Remember that these maps are drawn to scale. Main Building or the Administration Building – It is located at the bottom center of the map. It’s noted on the map that it was built in 1891. North Hall – This building is located to the left or north of the admin building. A note on the map states that this hall is currently being built. South Hall – As you can guess, this building is to the right or south of the admin building. The map also notes that this building was built in 1891. At the top left of the map is a building that is labeled “Bolier R’m 1st Laundry 2d” with the note “To Be Built as Shown”. There are two photos of the Union College laundry building in Nebraska Memories but the photos are from the 1940’s. I don’t have enough information to know if the building in the photo is the same building that is pictured on the map. 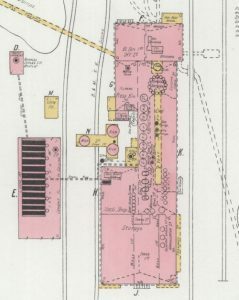 In the 1887 Sanborn Fire Insurance Map from Omaha, Douglas And Sarpy County, Nebraska I located the Garneau Cracker Factory on image 20. 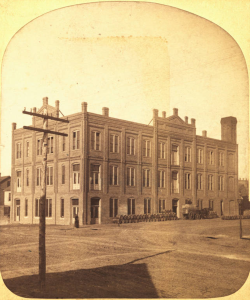 This building was located on the northwest corner of 12th and Jackson St. While it was interesting looking at the building and learning that they did the mixing on the 3rd floor and baking on the 2nd what really caught my eye was the last line in the blurb about the building. The line states “1 Doz. Hand Grenades”. I must admit that I had to stop and think about that one for a few seconds until I remembered that this is a fire insurance map. Those hand grenades were actually fire extinguishers. They were glass containers that were filled with a chemical. You were supposed to throw them at the fire causing the glass to break and releasing the chemical. If you would like to know more about them, I found a newspaper story in the 1884 Pacific Rural Press that includes a picture and description. I must admit that not all of my attempts to locate buildings on a map were instantly successful. 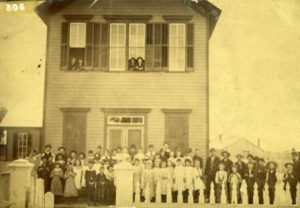 For example, the Cheyenne County Historical Society and Museum has a collection of 77 images in Nebraska Memories that cover a large span of time. In the LOC collection, there are two Sanborn maps for Sidney. One is from 1887 and the other is from 1892. Unfortunately, many of the buildings are not labeled with store names. I was able to find the First Sidney school on image 2 of the 1887 map. It’s located at the corner of 1st St. and Chestnut. After looking at the Sanborn maps and a current map of Sidney, I’m starting to wonder if the street names have been changed. For example, the note included on the photo of the M.E. Church, Sidney, Nebr. 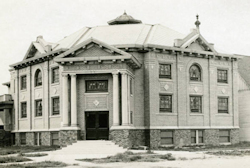 states, “This church, built in 1919, replaced the Methodist Church built in 1884 on the same spot.” The record also states that the church is located at corner of 11th and Jackson Streets and currently is the Sidney Arts Center. I looked at a current map and was able to find the building located across the street from the county court house. 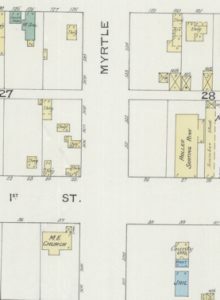 On image 2 of the 1887 Sanborn Fire Insurance Map from Sidney, Cheyenne County, Nebraska I located a building labeled “M.E Church” that was also located across the street from a building labeled “County Offs.” These buildings were located at the corner of 1st St. and Myrtle. If I’m correct, that means 1st St. on the Sanborn maps is now Jackson St. and Myrtle is now 11th Ave. With a bit more work, I’m sure it would be possible to match more of the photos with buildings on the map. I hope you enjoyed viewing these historical images, along with additional information available on the historical Sanborn maps. If you would like to do your own research there are plenty more images in Nebraska Memories and a long list of Nebraska Sanborn maps. This entry was posted in Information Resources, Nebraska Memories, Technology. Bookmark the permalink. 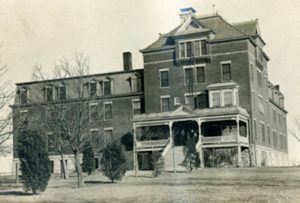 ← Throwback Thursday: Clarkson Memorial Hospital, Omaha, Neb. Hello. I may be able to help you out with those Sidney street names. Thanks for pointing me to the Sanborn maps! They help fill in some gaping holes – such as where the 1st school was! The various histories have a certain vagueness to them when it should be pretty cut annd dried. Thank you for sharing the link to the Sidney map. It’s great to see both the old and current street names on a single map.